In this episode Rennie discusses the importance of not allowing your the title, position, and status we have determine how we see ourselves in life. Rennie challenges listeners to be more than whatever the label the world may place on you. Joining him this week is Malcolm Mitchell, I professional athlete who exemplifies what it means to be a Game Changer! Tune in now to hear insights from Rennie and New England Patriots Wide Receiver Malcolm Mitchell. 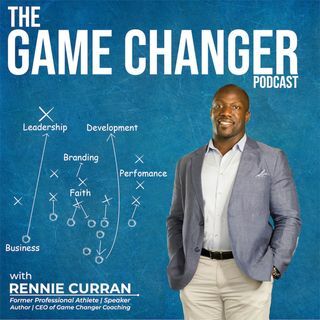 Rennie Curran is a former professional ... See More athlete, speaker, author, and CEO of Game Changer Coaching. Visit renniecurran.com for more information on events, blogs, and podcast!